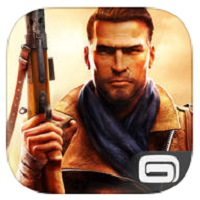 Brothers in Arms 3: Sons of War from Gameloft marks the return of this popular WWII game, and this time there are better graphics, gameplay and more action. This shooter also has plenty of new weapons, new kill cams and more explosions. It is, quite simply one of the best World War II games on mobile. You play Sergeant Wright, inside the game that takes place after D-Day, and you’re tasked with leading your band of soldiers into battle. Each one is trained and has special skills, and the more missions you win and do well in, the easier it will be to upgrade your weapons and expand your team’s skill set. Brothers in Arms 3: Sons of War is a unique game because you need to use your brothers effectively to gain a tactical advantage in the field. Skills include mortar fire, rocket blast, Molotov, air strike and more. As you play the game you and your team become more seasoned and prepared for the tougher battles ahead. The third person environment is very smooth, and the explosions and animation are among the most realistic on mobile. The missions are also varied, ranging from stealth to siege to assault and sniper, and you will also be required to go on assault in some. Many weapons are realistic, and the experimental ones can change the outcome of the game due to their power. The graphics are smooth and crisp both indoor and outdoor, and the addition of time of day and weather variation adds to the realism.